PHILADELPHIA -- A 22-point halftime deficit was no big deal for the defending NBA champions. Stephen Curry scored 35 points, Kevin Durant had 27 and the Golden State Warriors rallied for a 124-116 victory over the Philadelphia 76ers on Saturday night. "We take everybody's best shot every night but they fight and fortunately we turned it around," Warriors coach Steve Kerr said. Joel Embiid scored 21 points and Ben Simmons had 23 points and 12 assists for Philadelphia, which led 47-28 after one quarter and 74-52 at the half. But the Warriors erased that large deficit with a furious rally in the third quarter. Curry's 3-pointer got them within one point. He then made a pair of free throws to give Golden State a 90-89 lead. The two-time NBA MVP hit another 3 and Draymond Green blew past a defender for a dunk to make it 99-89 going into the fourth. "I was extremely aggressive in the first quarter, just didn't make the shots," Curry said. "We were more calculated in the third quarter." A raucous, sellout crowd that chanted "Trust the Process" most of the night went silent while the Warriors put on a shooting clinic in the second half. 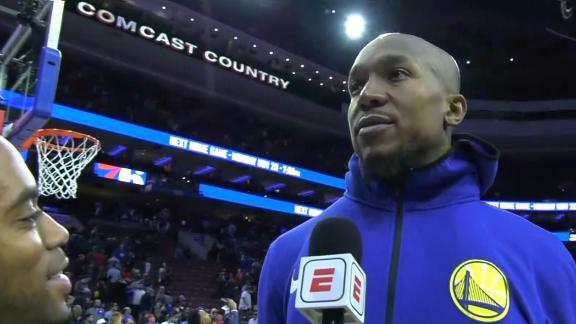 Even veteran David West came off the bench and made big shots in the fourth quarter to give the Warriors distance. He finished with 14 points. Klay Thompson had 16. "We weren't locked in, we weren't focused in the first half," Kerr said. "It took the embarrassment of being blown off the floor to get us going." Embiid was coming off a career-best performance -- 46 points, 15 rebounds, seven blocks, seven assists -- in a 115-109 win at the Los Angeles Lakers on Wednesday. It looked as if he was on his way to another monster game in the first quarter. Embiid embraced the frenzied fans and slapped hands with a guy sitting courtside after a dunk. But the Warriors showed why they're the best by stifling Philadelphia in the second half to improve to 12-4. The Sixers, who lost 135-114 at Golden State one week ago, fell to 8-7. "We have to play for 48 minutes," Embiid said. Playing his first game since receiving a lucrative contract extension, Robert Covington had 20 points for Philly. Back home for the first time following a five-game road trip to the West Coast, the Sixers showed no jet lag in the first half. They jumped ahead 15-4 following a 3-pointer by Embiid. Covington stripped Durant and hit a 3 to make it 37-18, electrifying the crowd. Durant's dunk off Green's alley-oop pass got the Warriors within 70-51 late in the second. But Embiid finished off the half with a dunk that sent the Sixers into the locker room up 74-52. "We have to focus, we have to take care of the ball and handle our defensive assignments," Simmons said. Kerr called a pair of timeouts minutes apart in the first half. The second one came after the play he designed wasn't run the way he drew it up. Curry took the blame for that one. "I forgot the play," he said. "Four dribbles in, I didn't know what I was supposed to do with the ball." Embiid, Simmons and the rest of the young Sixers left an impression on the Warriors. "They're gonna be a load coming up for years," Durant said. "You're seeing a team that you should start following." Kerr praised Philadelphia's dynamic 1-2 punch. "Embiid and Simmons are different," he said. "You don't see that anymore. Simmons is incredibly gifted. The two of them together are difficult to cover." Warriors: The 47 points allowed in the first quarter was their most given up in any quarter since Portland had 48 in the fourth quarter of a game on Nov. 14, 1992. 76ers: J.J. Redick scored 20 points, and Dario Saric had 13 points and 10 rebounds. Warriors: Continue their four-game road trip Sunday afternoon at Brooklyn. 76ers: Host Utah on Monday night. David West says that the Warriors settled down in the second half after an odd pregame, where the floor was not ready and Golden State did not have a team meeting.